No two people are the same. So, no two yoga practices should be the same either! As a yogi, it is important to consider your natural constitution. In Ayurveda, this is known as prakruti and is based on the predominant dosha, or body type. Your constitution affects many aspects of your life—from what you look like to how you deal with challenges, and everything in between. As your constitution is such a major influence, understanding it is a powerful way to develop an effective practice. In this article, we’ll take a look at the strengths and weaknesses of each dosha, and how you can use these to reach your highest potential through yoga and meditation. Kapha, Pitta, Vata… What Are These? Kapha: Governed by the Earth and Water elements, the main words to describe a kapha-dominant person are solidity and stability. The body type is large and heavy, with a tendency to gain weight easily. The hair is shiny and abundant, nails are thick, eyes are large and lustrous, and the skin is smooth and moist.Kapha people have relaxed personalities. They are calm, loving, and enjoy stable relationships. They like sleeping and eating. They are creatures of habit and are prone to attachment. Pitta: Pitta, a combination of Water and Fire, creates a body that is balanced, athletic, and well-defined. Naturally athletic, pitta people are active and energetic. They have an average build and fine hair. Skin is prone to freckles and acne.Pitta people are highly competitive and ambitious. They can be perfectionists and critical of others. They are generally very good speakers and enjoy a good argument. Vata: Vata people, governed by Air and Ether, are light and mobile, both physically and mentally. Sometimes very tall, they have slender builds with prominent joints and are prone to be underweight. The hair is thin, skin tends to be dry, and their features generally are very refined. Vata-dominant people are usually the most flexible, even hypermobile.The vata personality is characterized by creativity and a love of new things. They are very fast thinkers and full of exciting ideas, but sometimes can get lost in a whirlwind of mental activity. If you’re not sure which you are, you can go to an Ayurvedic doctor and get a full consultation. An experienced practitioner can pinpoint your exact constitution based on your pulse, tongue, eyes, fingernails, and other details. Otherwise, you can take an online quiz to get a basic idea of what you’re dealing with. According to Ayurveda, your dosha must be considered when you decide what you should eat, when and how much you should sleep, what exercise you should do, and what your yoga practice should be like. In a previous article, I wrote about the principles of an Ayurvedic diet, so you can look there for more details. The point of being aware of your constitution is not to try to create an equal balance of all three doshas in your being, since this is not natural for most people. Instead, you want to restore the balance of doshas according to your prakruti, the natural proportion you were born with. The same is true for spiritual practice more generally. There’s no one right cookie cutter program for everyone, but different paths and practices are more harmonious for different individuals. Now that you understand your constitution and tendencies, let’s take a look at how to develop a yoga practice suited to your dosha in order to counteract your imbalances and make the most out of your natural strengths. In kapha-dominant people, the inner fire (agni) tends to run low. This can result in sluggishness, drowsiness, poor digestion, low energy, and excess body weight. To counter this, choose a practice that is active and dynamic. The good news for kapha people is that you probably have a lot of vitality—much more than people for whom pitta or vata is dominant. This means that although your energy might be heavy and more difficult to get moving, once it starts moving you’ll have a lot of power. Surya namaskara: Sun salutations are dynamic and increase heat in the body, making them very effective for kapha people. By cultivating resonance with the Sun, considered the source of all activity on Earth, sun salutations balance out the cold, inert nature of kapha. Manipura asanas: Any asana that activates manipura chakra will help burn off excess kapha. Many manipura asanas are also very physically demanding, which is healthy for stimulating a slow metabolism and doesn’t allow for over-relaxation in the practice. Kapha people are generally calm and steady, which carries over into meditation. However, they tend towards dullness and sleepiness, and they are more likely to get stuck in patterns. There’s a danger of the practice becoming just another habit. Keep yourself fresh and alert in meditation by doing some yoga or exercise beforehand. It helps to meditate in a place with a lot of light. Be very vigilant about dullness. Maintain a firm, upright posture, with a commitment to staying clear. If you get drowsy, focus on your inhalation for a few breaths, visualize a bright light, or even open your eyes for a minute. Experimenting with new techniques and constantly reminding yourself of your motivation can help keep the spark in your practice. Devotional practices like prayer, Blowing on the Embers of the Heart, or singing bhajans are also very good. For pitta people, the main challenge in yoga is the restlessness of the body. These types will often love a more dynamic practice, with lots of sun salutations and moving quickly from pose to pose, but this is exactly what they don’t need! Since it can be difficult for fiery people to go directly into stillness, they can start their practice by channeling their intense energy. Go through a few rounds of surya namaskara, but with the emphasis on awareness, observing the inner stillness even while the body is in motion. Gradually decrease the speed of the performance and take longer pauses between rounds to center in the Heart. As the breathing pattern slows, this almost guarantees that the mind will also settle down. Once some of the physical restlessness has been burned off, you can go into a practice that emphasizes grounding and stability. Include a lot of forward bends and poses that don’t require much effort. These engage the parasympathetic nervous system, or the “rest and digest” aspect of the nervous system (as opposed to “fight or flight”). Try to deeply relax in every asana. Hold them for a long time and feel Stillness in every cell of your body. Even if you feel the urge to move, witness this impulse and absorb the energy without reacting. Pitta people have a fire inside. They can be very intense and focused, and dullness is usually not a problem. There are two main challenges that pitta-dominant people might run into in meditation. First, trouble relaxing. As I mentioned earlier, unharnessed fire energy brings a lot of physical restlessness. Until the body is settled, it will be difficult for the mind to become calm. That’s why it’s good to start with a more dynamic practice before settling into meditation. Second, the pitta personality is competitive, perfectionist, driven, and highly active. This is a double-edged sword in spiritual practice. It’s great to have a lot of passion and intensity. They say in Jewish Kabbalah that the Shekhinah (the feminine presence of God) gets bored with those who worship Her just correctly and within the rules: She wants people to be on fire with Divine Love! Pitta people aren’t ones to slack off in their practice or let it turn into a routine. However, when this drive comes from the ego, from a need to be the best or to make something happen, it becomes yet another barrier to realization. It can get you stuck more firmly in the idea of being the doer, developing an inflated spiritual ego, and make you prone to burn out. So, become friends with the idea that letting go doesn’t mean giving up. Cultivate surrender, a deeper octave of relaxation where activity is maintained while the sense of acting is dissolved. Consecrate before every practice and, afterwards, dedicate its fruits to the benefit of the entire Universe, as a reminder that your practice isn’t for yourself. Practice blindfolded or alone if you’re always comparing yourself to others. Finally, be compassionate towards yourself and humble in acknowledging your limits. Rest when you need to. Vata people are extremely active thinkers. The mind is always moving, and moving fast. This can make it hard to stay focused and relaxed during yoga. To settle down into the practice, it helps to work with the breath. Stay constantly aware of the breath, especially how it moves in your abdomen, and feel how it slows as you relax into each asana. Give plenty of time for the kaya sthairyam (the immobility of the body) phase of the asana, connecting deeply to your body and feeling the stillness in every cell. If you’re stuck in the mind, going into the body will pull you out of mental loops and into the present moment, since the body is only ever in the present. Predominance of the Air and Ether elements mean that vata people often lack vitality. This manifests as physical weakness and low energy. Vata people also often feel ungrounded, like they are lost in a colorful swirl of thoughts and plans and ideas, but somehow the connection to the concrete reality they inhabit is lost. Practicing a lot of grounding asanas helps with both of these problems. Asanas for muladhara chakra will both increase physical energy and bring mental peace, stability, and security. Best of all is to meditate and practice muladhara asanas while on the bare ground, to directly absorb Earth energy. Mental agitation is the main vata challenge in meditation. If you spend most of your meditation time chasing around your thoughts, try starting your practice with Capturing the Uncaught Mind, trataka, walking meditation, or any other technique to calm the mind. Come back as much as you can to a sense of stillness and relaxation in the body. The awareness of the pauses in the breathing cycle is a potent tool for calming the mind throughout the practice of meditation (and yoga). Sink fully into every pause, enjoying the feeling of timelessness. Vata loves change, excitement, and new things. 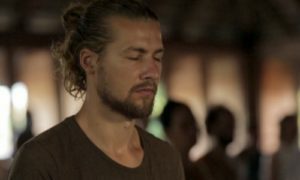 Vata people, therefore, are always eager to try new techniques and explore other practices. This is great for getting a wider perspective and keeping high energy in the practice. However, it makes it hard to go deep into anything. It is said that if you want water, don’t dig fifty shallow wells. Dig one deep well. It’s good to keep learning, living with a sense of curiosity and wonderment. But you should have a solid foundation. I recommend choosing a practice or technique that resonates with you and sticking with it every day, at least for six months or so until you can really see where it’s taking you. Along with that, you can feel free to experiment and try new things, but your practice will have a backbone to hold it up. I hope this article gives you some new directions to try out in your practice! Remember that these are just guidelines based on general principles. What resonates with you, keep and enjoy. What doesn’t, just let go. A basic knowledge of Ayurveda is extremely helpful for maintaining a healthy lifestyle and getting the most out of your yoga practice. I highly recommend studying it as much as you can. Natasha is a Hridaya Yoga teacher and frequent contributor to our blog. You can read all of her posts here.